Amazing doesn’t begin to describe Navajo tacos. 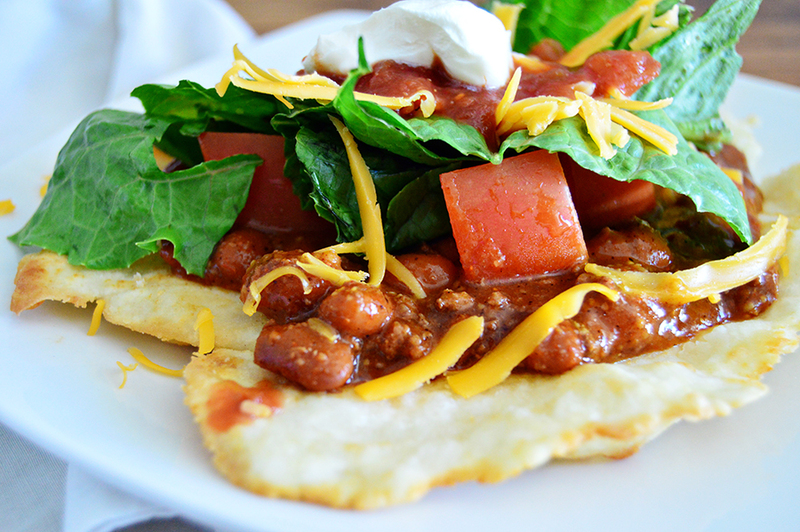 Delicious fry bread forms the base, which you top with chili and taco toppings. They’re colorful, flavorful, easy to make, and cheap – only about 75¢ per serving. 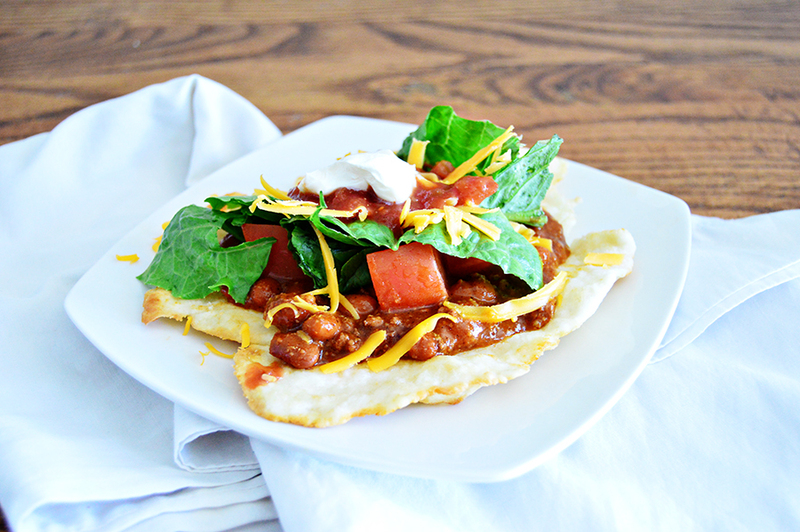 Fry bread topped with chili, cheese, tomato, and more! Mix together flour, salt, baking powder, and milk. Split dough into 8 similarly sized balls. On a floured surface, roll the balls to a 1/4 inch thickness. Melt shortening in frying pan. Lay dough in melted shortening and fry until golden on both sides. Top fry bread with chili and any other toppings desired. Enjoy! I roll my fry bread out. I have seen others use their hands to pull the bread into shape. Left over fry bread tastes great with butter and cinnamon sugar, or just a little honey butter! Next, you’ll split the dough into 8 balls, then roll the balls out on a floured surface. I like my fry bread to be about 1/4 inch thick so it can hold the crazy amount of toppings I put on it. Still can’t roll a circle. Guess my tacos will be square! Once all 8 balls are rolled out, melt the shortening in a frying pan on medium heat. I like to have a deeper one for this. The shortening is ready to go when you flick water on it and the shortening makes an awesome popping noise. This is kinda fun to do. Once the shortening pops, lay the fry bread dough in the pan. The dough doesn’t need to cook long – maybe 45 seconds on each side. It’s ready to turn when the tops of the dough bubbles are golden brown. See those lovely air bubbles? I have it on good authority that if you want your bread to be authentic, you have to pop the bubbles in order to let the evil spirits out. It’s an old Navajo tradition. Once your bread is golden on both sides, fish it out and lay it on a plate. Putting a paper towel down on the plate beforehand helps with blotting up the grease. Now all that’s left is loading your taco up with toppings. Once you’ve piled your fry bread high with deliciousness, you can try to eat it. Real Navajos can fold these things like a taco and eat them with no mess (I’ve seen it! ), but I can’t. I use a knife and fork to cut mine up. Doesn’t matter, because it tastes amazing either way! Did you like this recipe? Don’t forget to pin!